The Regular Route on Fairview Dome is a 12 pitch climb up the obvious steep northwest face of the dome. 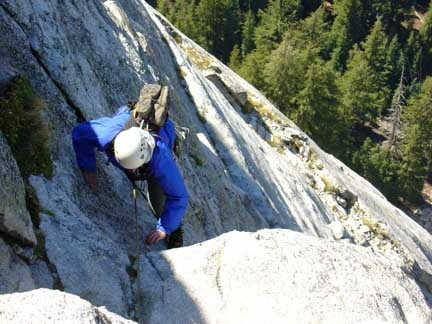 This climb is listed in the Fifty Classic Climbs of North America and described as such as one of the "routes which ambitious climbers dream of doing." 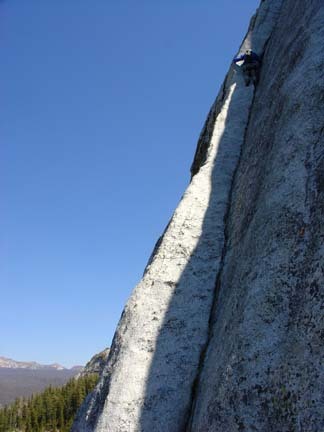 The first pitch contains the crux 5.9 moves-some friction moves on polished granite-and the higher one goes, the more relaxed the climbing becomes. 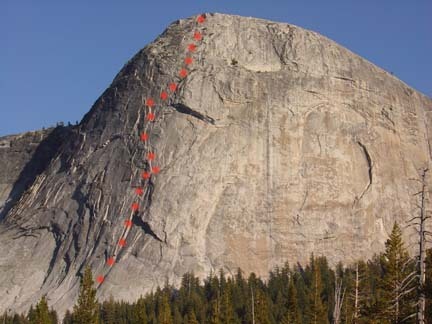 This climb would be the "test piece" for Bill and I on our two-week climbing trip to the Sierras and Tuolumne. We were very excited for the climb albeit it with a bit of reservation and nervous anticipation. It had been another cold night in Tuolumne. The mercury had dipped to below 26F overnight. However, this was relatively warm as we had planned to climb Fairview three days previous but the overnight low that day had been 14F. The Regular Route on Fairview Dome faces Northwest and it was September. That meant the crux pitch's crack likely never received any appreciable direct sunlight during the day. This being the case, we were in no hurry to get on the route early. We crawled out of the tent around 7am and cooked breakfast burritos to start the day. We then drove to the general store parking lot to get a cup of coffee at the neighboring food stand and pack up in the sunny parking lot. Killing time in the parking lot, we chatted with a woman from the bay area who had gotten so cold overnight that she had abandoned her tent for the warmth of her SUV around 2am. She seemed impressed that we stayed so warm in our three-season tent with 20F-degree sleeping bags. Around 10:30am we decided the day had warmed up enough to head towards the base of Fairview Dome. We drove the few miles west to the small parking area 20 minutes from the base of the dome and found the parking area empty. Good, we may just have the route to ourselves this day. Who else would be climbing a NW aspect on such an unseasonably cool September day? Dressed with poly-pro layers under our long sleeved shirts and pants, we followed the "brown carabiner" signs that mark the climber's trail from the parking area to the base of the Regular Route. It took us about 20 minutes to reach the base of the climb. Referencing the SuperTopo guide for the climb we easily identified the route which was still wholly shaded. The route was indeed devoid of other climbers so we scrambled up the third-class slabs to start of the first pitch. As domes often look, the first pitch looked very low-angle and short and we couldn't believe it truly was 200 feet to the little tree atop the first pitch. But we know how domes can be deceiving so we weren't surprised by this illusion. 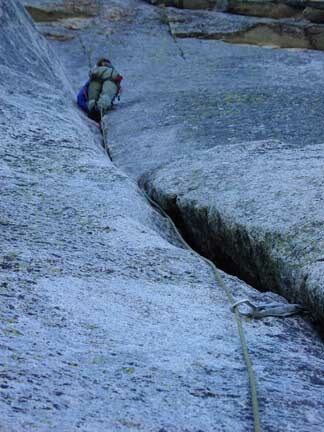 The SuperTopo guide shows a small belay stance 30 feet above the crux of the first pitch at about 160 feet up. That didn't look too comfortable compared to the spacious ledge with a tree another 40 feet up. We decided we'd stretch the rope and go for that tree. In a momentary lapse in judgment earlier in the trip, I had claimed I would lead the 5.9 crux first pitch. Despite very cold rock and cold hands, I wasn't about to back out of this commitment. Testosterone and pride are a tough combination to break. We racked up, flaked the rope and tied in. I had been wearing my hat, gloves and down jacket to stay warm here in the shade and only shed these comfort clothes when it was absolutely time to do so. A little after 11am I started up the parallel cracks that mark the first pitch. With my wing span, I was able to use both cracks for climbing and placed all the protection in the right crack. The crack simply devoured nuts and I was placing a healthy amount of pro on my way up. 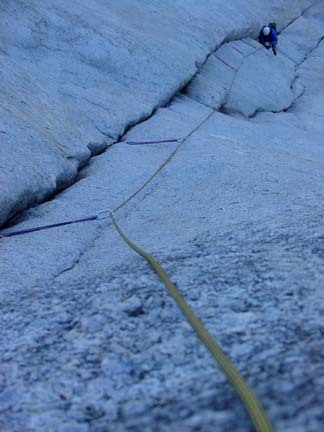 When Bill called, "Half rope," I knew I was about 30 feet below the crux. I could see where the rock bulged out a bit and knew that must be the crux. I moved up the 5.8 terrain to just below the crux placing another piece of pro in the crack right at the crux. Sure enough the left foot placements looked very thin and there was now only the single crack on the right. My hands were surprisingly warm now but the "sticky" rubber of my climbing shoes wasn't so sticky at these temperatures. Now I would have to rely on this rubber to smear a small left-foot edge as I moved through the crux. I could see what had to be done, I just had to go with it. I visualized the moves and committed to the left foot smearing. It was holding well enough so I worked my right foot up the crack a bit and then moved my right hand up to a deeper portion of the crack. Almost there. Another bump up of the right foot in the crack and I shifted my weight to the right foot jam to move my left foot up over the bulge to lower angle rock. Bingo, I was there! Standing up on both feet I placed another large nut in the crack on the right and sighed relief. From there the climbing was no more than 5.8 and the crack offered great pro placements. I barely reached the comfy tree ledge before running out of rope. I clipped into the numerous slings around the tree for my belay anchor and put Bill on belay. Bill had been standing in the cold for quite a while with his climbing shoes on and was certainly ready to climb. He started up but was complaining that his shoes weren't sticking too well due to the cold. As he reached my third placement, his left foot slipped unexpectedly causing to come off the rock. I had him on a solid belay but the unexpected nature of this fall took us both off guard for sure. Bill following pitch 1. The crux of the route is just above him where the two cracks meet and the rock bulges out. Back on the rock, he paid closer attention to the rock and was able to carry on without issue. However, at the crux moves, he left foot again slipped off unexpectedly causing him to come off the rock again. But Bill quickly regained his composure and climbed smoothly through the rest of the pitch. When he reached the belay ledge we re-racked and he showed a very impressive bit of climbing confidence by taking off on lead without complaint. I was very impressed by this as I'm sure I would have been asking him to lead the next pitch, rated 5.8, if the situation had been reversed. He started up complimenting the wonderful hand and finger crack as he climbed. It sounded wonderful and certainly looked to be a beautiful crack. Bill leading the second pitch. Awesome crack climbing. As he ascended I heard voices and noticed another team of two below us racking up for the first pitch. We exchanged pleasantries and I learned they were from Canada. They asked if this tree ledge I was on was big enough for another and I told them it certainly was. I now felt a bit pressured as I didn't want to slowing any other parties down on the route but if that would end up being the case, so be it. This would not turn out to be the case however as we climbed much quicker than they did. Looking up the second pitch that Bill was now leading, it appeared to be overhanging near the end of the pitch and I was very glad Bill was leading now. As he neared the section that appeared to be overhanging, he moved left into a shallow dihedral just below the belay. Since I had gone the full 200 feet during the first pitch, Bill was able to link pitches 2 and 3 that are listed on the SuperTopo and he reached the small edges in the dihedral that were said to be the best belay for the pitches and setup his anchor. I followed up the crack which was fantastic. At times I could get a super solid hand jam but at other times the crack was offset enough to use it as a positive flake. A very impressive lead for Bill indeed. But by the time I reached Bill, my hands were quite chilled due to the time spent on the belay ledge below and sticking my hands into the cold crack of pitch two. As we re-racked, I rubbed and warmed by hands before setting off up our pitch 3 which is listed as pitch 4 on the SuperTopo for the route. So I'll call this pitch 4 to stay on track with the "standard" way to climb the route. This pitch took me up great 5.6 to 5.8 cracks past two pitons and a large white flake that was somehow attached to the face. It appeared one could do some chimney moves to the left of this flake or step out to exposed knobs on the face to the right. I opted for the exposed knobs to the right which turned out to be very fun and straight forward. Once on top of the flake I went up more 5.7 flakes and knobs to the excellent and huge belay ledge in the sun on the Crescent Ledge. I placed a red camalot in a crack and sat behind a large flake for the belay. It was now only 1:00pm. I yelled to Bill that I was off belay and in the sun which surely motivated him to climb swiftly up the pitch. He went left at the white flake and said it was also very good climbing before joining me at the sunny belay ledge. At this point we noticed another team of two at the base of the route just getting started. The Canadians were still working pitches 2 and 3 so we had a lot of breathing room. The climbing from here on out promised to be more relaxed and just plain fun. Our spirits were high having completed the crux pitches already. It was a beautiful day and warming up nicely. The climbing to this point had been sweet and we were excited for more. Bill started up the nice 5.4 ramp of pitch 5 that soon turned into great 5.6 flake and knob climbing to a short 5.6 crack before the belay. Leading up the generous ramp from the "Crescent Ledges" belay. I followed Bill up the pitch appreciating the knobs and flakes that were at our disposal. Leading pitch 6 was a blast as it started out with easy ramp climbing leading into a small roof that was protected by a piton placement. This 5.7 roof move really got my attention but once I committed to the hands of the positive flake above the roof, it went easily. I was elated to have pulled my first alpine roof! We decided I would link pitches 6 and 7 as they were quite short. Easier climbing lead to another nice belay ledge with a small tree. I brought Bill up to the ledge and we sat for a spell watching the two climbing teams below us work through pitches 4 and 2 respectively. Following the 5.7 roof pitch. From here Bill lead an upward traversing pitch 8 up terrain that gradually got easier to a large belay ledge next to a big tree about 160 feet out. After I followed his lead and joined him at the belay, we decided to simul-climb the rest of the route as it looked to be no more than the occasional 5.6 move with most of the climbing being considerably easier. It was 3:20pm when we started the simul-climbing and after 20 minutes of my leading us through the simul-climbing, we made some final 5.4 knob moves onto the summit at 3:45pm. Crimping on knobs, Bill pulls the final moves to the summit of the dome. The view of the meadows and surrounding peaks was awesome. Mount Conness loomed to the north while we could see Cathedral Peak and the Eichorn Pinnacle to the south. Tenaya Lake gleamed in the valley to the southwest. 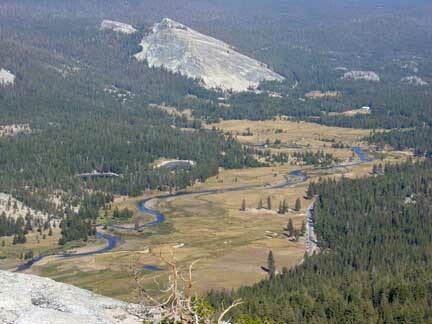 Looking east we could see the meadows from which Tuolumne gets its name as well as Lambert Dome. We lunched on the summit and relived the climbing we had just completed. The route truly was awesome and by far the best route of our trip. We climbed the route in 4:45 which was far faster than our anticipated 6 hour ascent time. The wind was calm and the weather beautiful. We donned our approach shoes for the slab descent and made it down and back to the base of the climb to watch the other two parties working up pitches 7 and 4 respectively. Seeing them on the route really put the scale into perspective. We hiked the 20 minutes back to the car and returned to camp to drink a beer to our success!